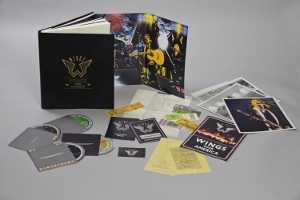 Paul McCartney’s greatest live album, Wings Over America (1976), is the next addition to the slowly-growing Paul McCartney Archive Collection. It hits retailers on May 28, 2013, in standard and deluxe editions. Furthermore, the long-unavailable complete and remastered concert film Rockshow will release on DVD and Blu-ray, the first time on either format, on June 11. Concord Music Group, who has handled all of the Archive Collection releases so far, has revealed details about the upcoming set. The standard two-CD remastered album will be available for casual fans, no bonus tracks or extras. But those completists who must have it all will want to start saving for the elaborately-packaged deluxe edition. This one looks like it just might outdo the behemoth box set version of RAM from 2012. Most importantly, the deluxe includes a third CD of previously unreleased live material (eight songs) from a concert at San Francisco’s Cow Palace. 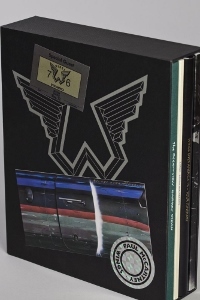 It also includes a DVD of the 75-minute television documentary Wings Over the World, which has circulated amongst the bootleg collector’s market for decades. This will be its first official home video release. I would’ve personally liked more than eight songs on the bonus disc. However, it will be interesting to hear this material because (unless it was worked on significantly in the studio back in ’76) it may present a rawer, completely undoctored Wings. Don’t get me wrong, I love the official album but it has been widely documented that some clean up recording was done in post-production to get the band sounding as good as it does. One source for this is Keith Badman’s <i>The Beatles After the Break-Up: 1970-2000</i>. I’ve not heard soundboard tapes of the shows used for the official album though. It looks like MPL has outdone themselves with the books and other collectible material this time. The prime attraction is a 110-page commemorative book that documents the behind-the-scenes action on the mammoth tour. There’s also a book of Linda McCartney’s photographs from the tour, Look. The hardbound The Ocean View is a book of artwork drawn by artist Humphrey Ocean, who apparently was commissioned to travel with the band and capture them through drawings and sketches. Keep an eye out for deals. The deluxe set is available for preorder on Amazon, currently at a whopping $140. 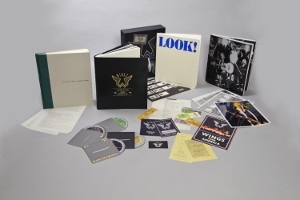 I don’t see any preorder info for the concert film Rockshow on Blu-ray and DVD (from Eagle Rock Entertainment), originally released in 1980 but filmed during the Wings Over America tour in 1976 (with lots of footage from the famous Kingdome show in Seattle, the first concert at that now-demolished domed stadium). Some fans have expressed early disappointment that this wasn’t included in the Wings Over America deluxe set. I think there’s definitely enough general interest to justify the standalone release. The feature film was remastered from the original 35mm source and remixed to 5.1 for the first time. And one more bit of awesome McCartney news. Rockshow will receive a one-day-only theatrical release in (very) select theaters on May 15, 2013. From the press release: “The theatrical release features an exclusive introduction with Paul McCartney, but there will also be an exclusive VIP premiere screening of Rockshow, with Paul in attendance and introducing the film, at BAFTA on 15 May 2013.” For more info on the theatrical screenings, click here. An exciting release, but Over America, it has been proven, was NOT significantly worked on/doctored in the studio. Very little work was done, mainly the odd backing vocal/guitar but something like just over ten edits. Wings were a really tight band. It’s Rockshow however that received all the overdubs and the like. Thanks for the comment. I’ve not seen any source that says that says “very little work” was done on the live album. I’ve made some edits to the article nonetheless, since I realize I was suggesting (without citing sources) that it was a a major re-recording. What do you mean proven – have the soundboard tapes for the specific shows used on the album surfaced on bootleg?